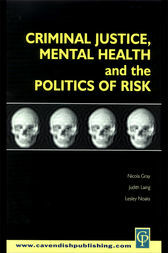 Criminal Justice, Mental Health and the Politics of Risk addresses the important issues which lie at the forefront of decision making and policy in criminal justice and health care. The book brings together several perpectives from a number of distinguished academic lawyers, criminologists, psychologists and psychiatrists. It is multi-disciplinary in its approach and is jointly edited by a lawyer, a criminologist and a psychologist - all of whom have expertise and experience in this field.